You didn't come to eat in Seminole Heights for normal, did you? Stormy was in a bit of a mood the other day. The type of mood that could only be caused by a hangry woman. For those of you who don't know, hangry is a word used to describe someone who has moved beyond hungry, and is now angry because they're so hungry. We were going to meet a friend of ours up at the Red Star Rock Bar a little later, so we decided to stay in the Heights. Our first choice on this particular evening wasn't Fodder & Shine. It was actually the Front Porch, however, Front Porch had a twenty minute wait and we needed to meet our friend, so we opted to go next door. The thing with restaurants, and just about anything else, in Seminole Heights is that there is often very little parking and the buildings themselves are typically very small. We were lucky. There were about two parking spots open at Fodder & Shine, one of which I was able to secure, and we were able to get a table instantly. I have been to Fodder & Shine before. I'm aware that the food will tend to take a little longer than going to a chain restaurant, the two seater tables are typically small and in a weird shape, and the staff is always interesting to talk to. Fodder & Shine is the brain child of chef-owner Greg Baker, who claims the inspiration came to him while he was working at a French restaurant. His plan was to open a restaurant that serves good food at affordable prices. He also owns the restaurant "The Refinery" up the road and uses the same vision. Whereas The Refinery rotates its menu weekly, Fodder & Shine tends to hold on to the same menu, year-round. 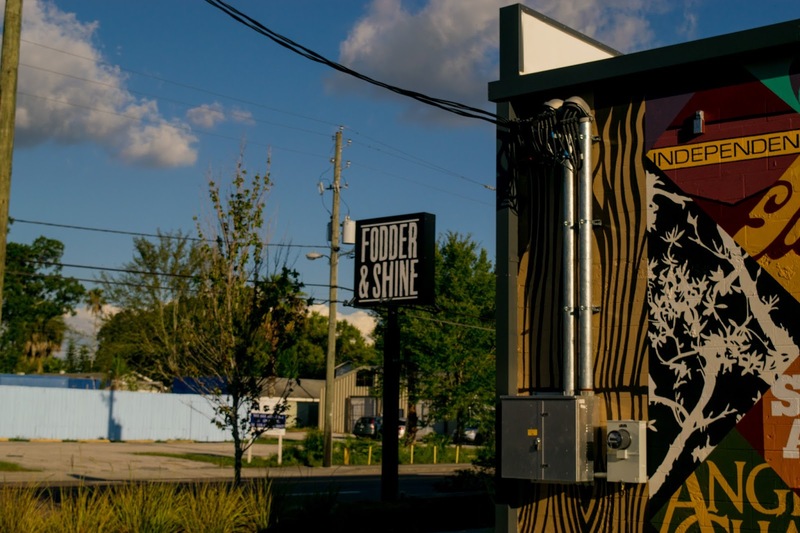 Fodder & Shine opened in 2014 and has been serving up interesting food items on a limited menu since. Were you expecting normal? Then Seminole Heights isn't your neighborhood. On this particular occasion, our waiter was Brian. He was calm, albeit a bit calmer than I'm used to, educated on the menu, and quick. I never once had to stop him for a refill. This was especially impressive once you realize that the restaurant was almost to capacity, as new patrons were electing to sit outside. On to the food. 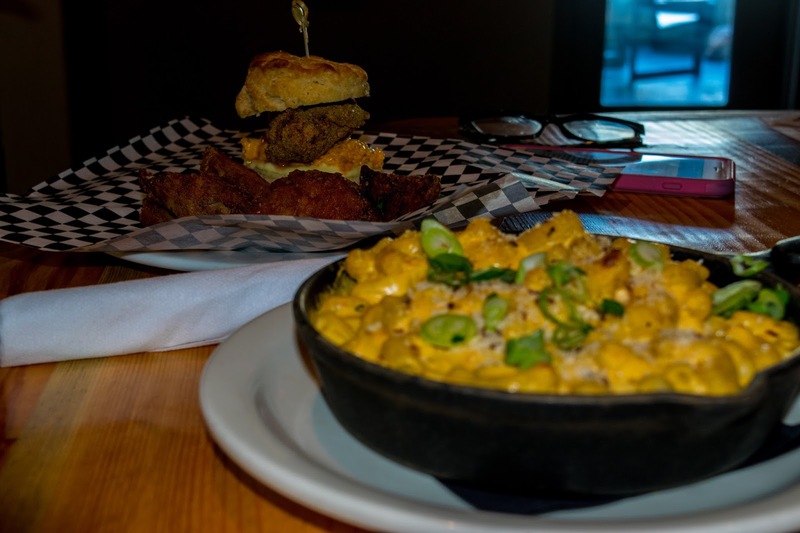 Now, I'll be the first to tell you, it takes a bit of getting used to the food you tend to find at locally owned restaurants in Seminole Heights. Fodder & Shine is no different. I was a bit thrown off the first time I had come here, but the more I come, the more I enjoy it. The picture you see above is my plate. I elected to get the chicken biscuit (all the way, minus the slaw). It comes with a hearty battered and fried chicken breast, an overeasy egg on top of a thick cut slice of bacon, house made jam, mahonesa, and a Pimento cheese spread. Stormy got the barebones version, opting for the chicken breast and Pimento cheese spread. We also indulged by getting a side of PBR mac & cheese. The weakest part of my sandwich was the bun. It was a bit on the harder side and half of it had crumbled after two or three bites. That didn't stop me from making a mess, however. The cheese made the biscuit hard to keep together and didn't add a whole lot, in my opinion. The bacon and the egg, on the other hand, made this one of my favorite chicken sandwiches. When asked how she enjoyed her meal, Stormy exclaimed, "It was good." The PBR mac & cheese is where our opinions differed the most. I really enjoyed it. Stormy, on the other hand, did not. PBR was a very interesting choice for a beer to use in a beer cheese, and it's not a beer I much enjoy drinking, but I think it made for a perfect cheese pairing. The presentation in the iron skillet made it even better. We had finished our food and it was time to cash out and meet our friend. The final bill came to $46 and some change. I, personally, found it really expensive. 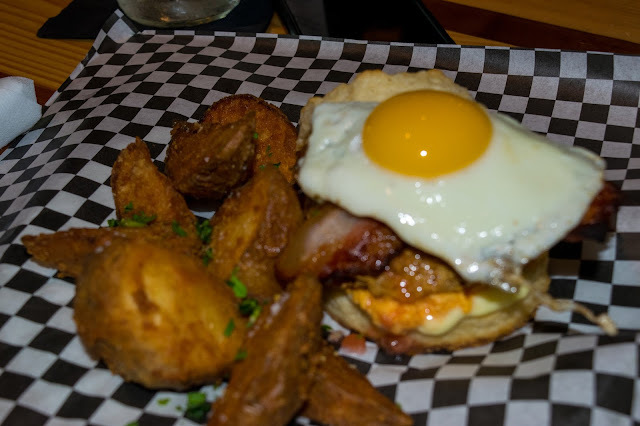 The chicken sandwich base is $6, then bacon is an additional $3, the cheese is another $2, the egg is $2, and the fries were $4 (that was expected, you were essentially making it a meal). This brings a $6 chicken sandwich to $19. The mac & cheese was another $7, which I didn't think was outrageous as there was easily enough to feed three people and it was really good. Just be aware that if you're going to top any of their biscuits, you're going to rack up a high bill really quickly. That said, the food was really good. They also have a killer list of craft beer on draft. Unfortunately, since we were going to another bar, we didn't want to overdo it. Definitely check out their drafts, however. - This is not a chain restaurant. The bill will be slightly higher than a Chili's or Applebee's. - You will have to go in with an open mind. There are some unique creations on this menu that are definitely worth checking out. 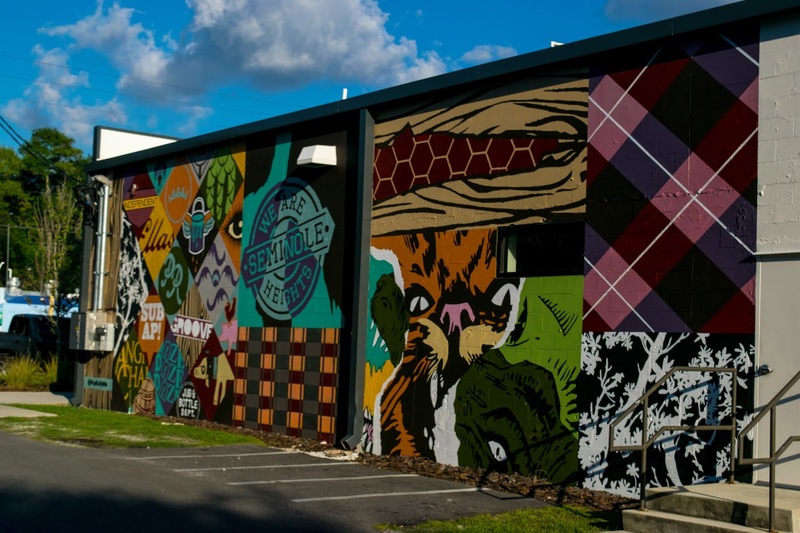 - The parking lot, despite being one of the biggest in Seminole Heights, is incredibly small. What is your favorite meal to have when you go to Fodder & Shine? What is your favorite "new experience" to have here? Leave a comment below. If you'd like more information on Tampa, check out my YouTube Channel and if you'd like to support my efforts, don't hesitate to buy a shirt from our Spreadshirt. Also, don't be afraid to click subscribe and you'll instantly be notified whenever a new entry is posted. Thank you all and I will see you next time!